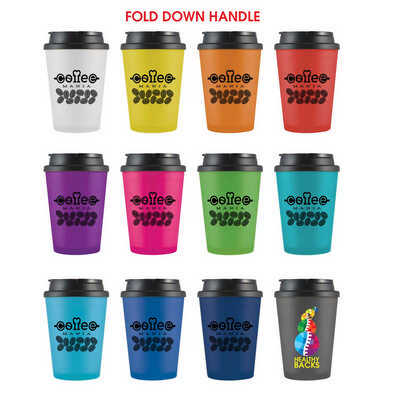 350ml double walled hot/cold cup with silicone sealed flip up lid. Tough foldable carry handle. BPA free. Microwave safe. Not recommended for dishwashers. Colours - Black, Clear, Dark Blue, Green, Light Blue, Orange, Pink, Purple, Red, Yellow Size - 136mmH x 90mmDia Decoration Area(s) - Roll Print (max 1 colour print) : 220 x 55mm (LxH); 4CP Digital Direct : 32 x 100mm (LxH). Price includes : 1 Col 1 Pos Roll Print. Setup is included.